Source: [http://en.wikipedia.org/wiki/Le%C5%9Bnowo Wikipedia Commons]'']] Reimerswalde (now known as Leśnowo; coordinates: 54.224951, 19.073081 [54° 13′ 29″ N, 19° 4′ 23″ E]; population in 1905, 188) is located approximately 3 kilometres (2 miles) west of Nowy Dwór Gdański ([[Tiegenhof (Pomeranian Voivodeship, Poland)|Tiegenhof]]), 21 km. (13 mi.) north of Malbork ([[Marienburg (Pomeranian Voivodeship, Poland)|Marienburg]]), 21 km. (13 mi.) north-west of Elbląg ([[Elbing (Warmian-Masurian Voivodeship, Poland)|Elbing]]), and 33 km. (21 mi.) south-east of the regional capital Gdańsk ([[Danzig (Poland)|Danzig]]). Reimerswalde (now known as Leśnowo; coordinates: 54.224951, 19.073081 [54° 13′ 29″ N, 19° 4′ 23″ E]; population in 1905, 188) is located approximately 3 kilometres (2 miles) west of Nowy Dwór Gdański ([[Tiegenhof (Pomeranian Voivodeship, Poland)|Tiegenhof]]), 21 km. (13 mi.) north of Malbork ([[Marienburg (Pomeranian Voivodeship, Poland)|Marienburg]]), 21 km. (13 mi.) north-west of Elbląg ([[Elbing (Warmian-Masurian Voivodeship, Poland)|Elbing]]), and 33 km. (21 mi.) south-east of the regional capital Gdańsk ([[Danzig (Poland)|Danzig]]). It was situated to the east of [[Neuteicherwalde (Pomeranian Voivodeship, Poland)|Neuteicherwalde]], to the west of [[Petershagen (Pomeranian Voivodeship, Poland)|Petershagen]], and to the north of [[Orlofferfelde (Pomeranian Voivodeship, Poland)|Orlofferfelde]]. Reimerswalde was part of the Kingdom of Poland until 1772. The First Partition of [[Poland|Poland]] in 1772 resulted in the creation of a new province in 1773, called [[West Prussia|West Prussia]], in which Reimerswalde was located. 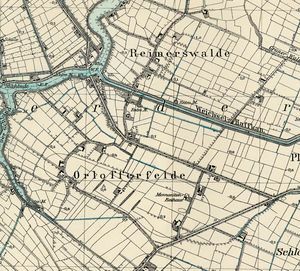 Reimerswalde was situated in the district (Kreis) of Marienburg until the establishment of the [[Danzig, Free City of|Free City of Danzig]] in 1920. The village came under the control of Nazi Germany during World War II until February 1945, when it was occupied by Soviet forces and returned to Poland. In 2012 Reimerswalde (now Leśnowo) was a settlement in the administrative district of Gmina Nowy Dwór Gdański, within Nowy Dwór Gdański County, Pomeranian Voivodeship. Reimerswalde (now known as Leśnowo; coordinates: 54.224951, 19.073081 [54° 13′ 29″ N, 19° 4′ 23″ E]; population in 1905, 188) is located approximately 3 kilometres (2 miles) west of Nowy Dwór Gdański (Tiegenhof), 21 km. (13 mi.) north of Malbork (Marienburg), 21 km. (13 mi.) north-west of Elbląg (Elbing), and 33 km. (21 mi.) south-east of the regional capital Gdańsk (Danzig). It was situated to the east of Neuteicherwalde, to the west of Petershagen, and to the north of Orlofferfelde. Thiessen, Richard D. "Reimerswalde (Pomeranian Voivodeship, Poland)." Global Anabaptist Mennonite Encyclopedia Online. November 2012. Web. 25 Apr 2019. http://gameo.org/index.php?title=Reimerswalde_(Pomeranian_Voivodeship,_Poland)&oldid=123972. Thiessen, Richard D. (November 2012). Reimerswalde (Pomeranian Voivodeship, Poland). Global Anabaptist Mennonite Encyclopedia Online. 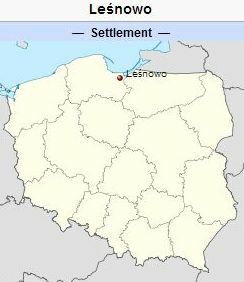 Retrieved 25 April 2019, from http://gameo.org/index.php?title=Reimerswalde_(Pomeranian_Voivodeship,_Poland)&oldid=123972.